Mr. Abdulla Nasser Al-Naimi has extensive experience of strategic planning and of managing the development and implementation of policies and procedures across directorates and ensuring the successful delivery of departmental and organisational goals and objectives. He has more than fifteen years of experience in financial planning, risk management, information management and performance management in a variety of organisations. Mr. Al-Naimi also has considerable experience in procurement and financial control projects. Mr. Al-Naimi’s experience dates back to 1998 where he started his career at Qatar National Bank in the Electronic Bank Department. Following that role, he moved to RasGas in 1999, initially as a Purchasing Administrator in the Supply Department. He progressed through that department, holding a number of roles including Senior Buyer and Contracts Analyst before he was promoted to Procurement Superintendent in 2008. Then in 2010, Mr. Al-Naimi moved to Qatar Foundation, accepting a role as Service Contracts Senior Manager in the Procurement Directorate. 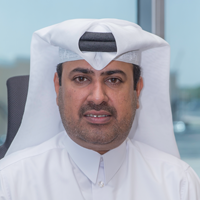 After a track record of success and delivery in that role, he was promoted to Procurement Director in the Procurement Directorate at Qatar Foundation in 2013. In January 2016, Al-Naimi was appointed Director General of Aspire Logistics, a member of Aspire Zone Foundation. Mr. Al-Naimi holds a degree in Business Administration and Economics from Qatar University, and an Executive MBA from Plymouth University. He is also member of the Chartered Institute of Purchasing and Supply (CIPS).